Envirodyne Group (EDG) is a representative for the unique US developed oil-in-water separation technology - MycelxTM. Wastewater streams containing hydrocarbon based materials continue to be a major source of concern for environemntal sustainability in that even trace levels of many pollutants can be potentially harmful to all types of ecosystems. Currently, many systems used for the collection and removal of hydrocarbon based materials rely on expensive methods such as stripping processes etc., that use significant energy inputs to operate effectively. The MycelxTM technology was developed around the discovery and patenting of the MycelxTM molecule that possessed unique properties of attracting and permanently immobilising oil in air and water without fouling or developing system pressure. The MycelxTM oil removal molecule has been uniquely tailored into products and systems to provide a high efficiency cost effective solution to oil-in-water and oil-in-air problems. Envirodyne Group (EDG) through its MycelxTM connections, designs and builds industrial and greywater treatment systems that allows for the reuse of treated water in industrial processes, or a Class A standard treated water, able to be reused in domestic applications such as toilets, laundry and within site irrrigation systems. With the onset of water shortages and the inability of communities to build dams for storage, or increasingly continue to draw down on limited aquifer systems, the alternative of reuse for many situations is attractive. EDG will combine features of HydroSentinelTM into the wastewater treatment process to ensure compliance with regulatory requirments for discharge to sewer or for reuse. EDG can provide a detailed cost benefit analysis for client review as part of a total solution package to determine the feasibility of treated water reuse. Below are some examples of industrial and greywater applications involving MycelxTM incorporated into a total operating packages to suit particular client needs for licensed discharges or water reuse. MycelxTM is the ideal pretreatment process for membrane filtration and disinfection systems where low level contaminants are critical for plant processes. MycelxTM is capable of filtration down to 0.5 micron particle size. Refer to Dowloads for more information on MycelxTM. 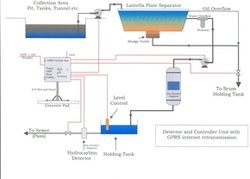 An integrated solution for a foundry for the removal of oil-in-water and heavy metals, along with monitoring and control for discharge of treated water to the sewer. A packaged waste water treatment system to buffer solution to neutral pH, remove heavy metals to less than 5 ppm concentrations with filtration to 10 micron, and UV disinfection for reuse of water in the plant process.